Jane Austen’s life was hugely successful. She influenced the shift away from Gothic literature, broke ground for other female writers, wittily critiqued contemporary society, and may have coined the term ‘base ball’ before Abner Doubleday even invented the sport (see Northanger Abbey). Most importantly, though, she penned enduring novels that may act as guidebooks to becoming a virtuous woman. Austen’s best known work, Pride and Prejudice, demonstrates that women harbor a great power: the ability to elevate themselves and others—particularly their suitors—to higher character and virtue. Elizabeth Bennet, the esteemed protagonist of this novel, proves that the moral elevation of oneself and the insistence that others rise to equal this will ultimately enable all to arrive at true happiness. While some may argue that it is Elizabeth’s defiance that entices Mr. Darcy, it rather seems to be her noble character that garners his love. As the story unfolds, Elizabeth’s refusal of Mr. Darcy’s initial marriage proposal prompts a banishment of his greatest vice—pride. In her typical fiery manner, the heroine tells Darcy, “From the very beginning… of my acquaintance with you, your manners impressing me with the fullest belief of your arrogance, your conceit, and your selfish disdain of the feelings of others, were such as to form that ground-work of disapprobation…”. Shocked by her bold refusal and acknowledgment of his gravest faults, Darcy begins a period of self-reflection and growth. Eventually, Darcy amends his imperfections so as to earn Elizabeth’s hand in marriage. Because she did not waver in her convictions and refused his first proposal, the protagonist finds happiness in a marriage to a man of great virtue, tenderness, and patient love. Through Pride and Prejudice, Austen offers Elizabeth Bennett as a model to embolden women to not only elevate themselves, but to also insist that men rise to these heights so as to endeavor to deserve them. It is her goodness and her demand that he match this goodness that ultimately brings the formerly pompous man to one knee. Elizabeth encourages moral growth in Mr. Darcy and he is, therefore, drawn to her—the one who may always ensure that he does not ever find himself in moral stasis, unable to conquer vices that naturally arise in human nature. Mansfield Park’s heroine, Fanny Price, embodies the virtues of constancy and fortitude. Though she must contend with constant subjugation by and the immoral behaviors of her affluent relatives, she manages to avoid any wrongdoing. When tempted to go against her uncle’s wishes and perform in a lewd play, she tells her cousins, “‘I could not act anything if you were to give me the world.’” Not even “the world” would be enough enticement for Fanny to deny that which she holds to be right. She simply refuses to waver in her convictions. She also withstands the horror of a proposal from a spineless Mr. Henry Crawford. She finds herself unable to love a man who lacks virtue and refuses to give up on the one whom her heart truly desires— the aspiring clergyman, Edmund. Despite pressure from many to accept the marriage proposal, her devotion holds fast. Though Fanny exists, for a majority of the novel, in her own lonely cocoon of discretion and integrity, she emerges victorious at the story’s close. Austen clearly esteems her protagonist, writing her into a happy life, wed to Edmund and preserved from the immoral horrors of Mansfield Park. Anne Elliot of Persuasion exemplifies similar virtues, avoiding the ruckus of her surrounding environments and persisting in her pure love for Captain Wentworth. In a very literal example, she, at one point, sits in front of a hedgerow with a “bush of low rambling holly” protecting her, while others gallivant about her, exploring and gossiping. She also chooses to associate with her old schoolfellow, Mrs. Smith, rather than the wealthy Lady Dalrymple. Pride, pretension, and desire of status are wholly absent in Anne. She simply desires goodness, congeniality, and a healthy dose of intellectual substance in others. Just as Fanny receives an unexpected marriage proposal, Anne too finds herself tempted by the hand of a man who can offer her great wealth and status. She refuses, in favor of the true and unselfish love that she has for Wentworth. Again, Austen rewards her heroine by making her ending a happy one—union with the man who will be truly good for her soul. Austen brings to life many more virtuous women, such as the innocent Catherine Morland and the magnanimous Emma Woodhouse— all who show readers how to act with the grace and virtue that marks a truly great woman. 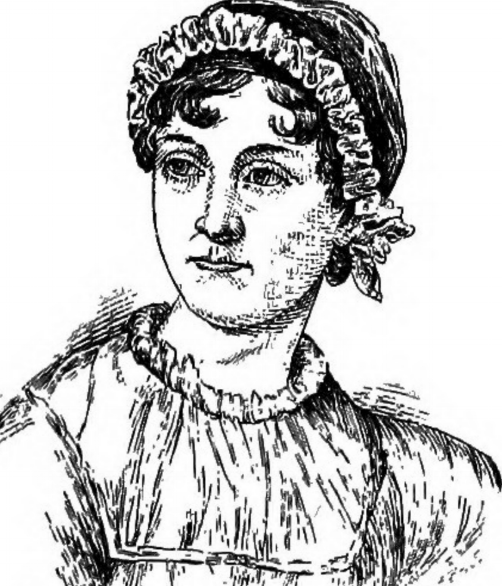 We can thank Jane Austen for her witty prose, influencing of romantic literature, and social commentary. We can most significantly thank her for revealing that woman's true strength resides in her virtue.